The new feature has to do with streaming videos on whatsapp without downloading it first. Normally, it used to be, when one send or share you videos on whatsapp, the very first thing you need to do is to download the videos before you can have access to watch them. But as it stands, Whatsapp is currently working on a new update that will enable users to stream/watch video without having to download it first. The feature is already made available on WhatsApp beta version 2.16.365. Now, instead of you clicking on download button when one share you videos, you will see something like play button. Now, when you tap or click the play button, the video will start buffering, and then you will be able to watch the video while it is being downloaded on your smart phone. This very feature of video buffering is exactly the same like the thing you see when watching videos online, for example on YouTube. 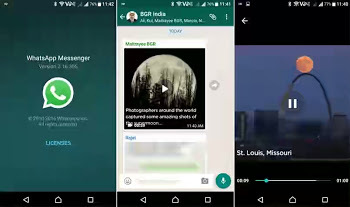 Official WhatsApp Video Call App Now Functional For All To Use - Check It Out. Facebook Latest Update On iOS App, Adds Ticket For Movies, Request Appointments And Many More. Guide On How To Share Applications On Apk/Zip/Pdf Files Through Whatsapp Chat App To Anyone. Like I said above, this WhatsApp video streaming feature is only available on the Beta version and you can download it from Google Playstore. Stay tuned because in no distant time, the feature will be rolled out for normal regular whatsapp and then all using Whatsapp can then partake to enjoy the feature.